Will You be Ready for FOG Control? Home » Endura - Product Insights » Will You be Ready for FOG Control? Until recently, Miami-Dade had a greasy situation on their hands. Between 2007 and 2012, sewer-performance issues resulted in 50 million gallons of sanitary overflow into the environment. This drew the attention of the Environmental Protection Agency (EPA) and their enforcement of the Clean Water Act. The resulting settlement required Miami-Dade County to pay $1 million in civil penalties – split almost evenly between federal and state governments. The settlement was also conditional on a significant investment to fix the ailing sewer system; estimated at a cost of $1.6 billion. Today, Miami-Dade is leading the way by taking a fresh look at grease interception technology and implementation. Like all sewer systems in densely populated areas, Fats, Oils and Grease (FOG) put major stresses on the system’s ability to manage sewage. Clogs and overflows are commonplace, resulting in back-ups and untreated discharges. Removing these blockages cost cities millions. To deal with this, and to comply with the EPA settlement, Miami-Dade developed and implemented the most comprehensive FOG Ordinance in North America. Now, only FOG control devices that meet Miami-Dade DERM’s most stringent standard may be installed and operated where wastewater and grease discharges into the municipal system. Management, maintenance and operations standards were developed along with construction compliance, inspection and enforcement protocols. The Endura® line-up of Hydromechanical Grease Interceptors (HGIs) are providing the Miami-Dade restaurant industry a means of effectively managing FOG-compliance requirements. Endura® was the first HGI to be certified to a 99% removal efficiency, and have since qualified a total of 5 compliant solutions for this evolving market. To keep FOG from being released, HGIs rely primarily on the difference in specific gravity between wastewater and FOG. Grease is then retained for future removal without escaping into the sewer lines. The ability to provide efficient separation of FOG from wastewater, especially in higher capacities, is crucial for urban areas. Aging sewer systems are sensitive to the pressure of clogs and/or reduced wastewater flow. Not only is this an enormous burden on municipal resources, the flooding that results can be debilitating for businesses and a health risk to city inhabitants. For companies like Endura®, this challenge presents an opportunity. Regulatory bodies, such as the EPA, as well as strapped municipal budgets will put additional pressure on cities to modernize their environmental protection standards. To illustrate the impact of this revolutionary new ordinance model, consider that following comparison. Miami-Dade DERM’s new FOG Control ordinance 2.0 requires that GI devices restrict FOG output from exceeding 100mg per litre of effluent. Studies done in other cities have shown outputs to be more than ten times this level. This means there will be a growing need to have innovative, effective and efficient grease interceptors to ensure cleaner, safer wastewater. At Endura®, we believe that interception is the best defense. That’s why we work with cities, municipalities and regulatory agencies across the country to develop long-term solutions that benefit everyone. Endura® is a registered trademark. A deep dive into grease interceptors, the different types and how they work. Case Study: Installing a 25 GPM grease interceptor in a limited space kitchen. How Much is FOG Costing Us? The battle against Fats, Oils and Grease is on.Aging city sewer systems are being choked off by, as it’s known in the industry, “FOG”, and the buildups and the debris they collect. Grease is putting major stress on sewer systems. Even more stressful to restaurant owners, grease can be the cause of costly backups that have damaging effects on business. 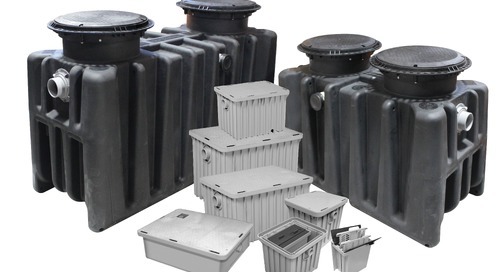 Today, hydromechanical grease interceptors (formerly called grease traps) come in all sizes and shapes. With damage to sewer infrastructure on the rise, taking action and making clear changes for a better environment and future is essential. One of the most important tools to ensure sufficient grease management within a facility is to correctly size, install and maintain a grease interceptor. Each installation is unique. Ensure that the grease interceptor you install is the correct size for the application. South Florida county ordinance could provide municipalities roadmap to improved grease intercepting capabilities. Guided by a philosophy of minimizing downstream toxic waste, Endura® engineers have designed grease interceptors that serve the best interests of the community and the wastewater ecosystem. Get the answers to your frequent questions about Endura products and technologies. Removing fats, oils, and grease from wastewater is what Endura® does. Doing it in a way that is green and less costly is where it excels.